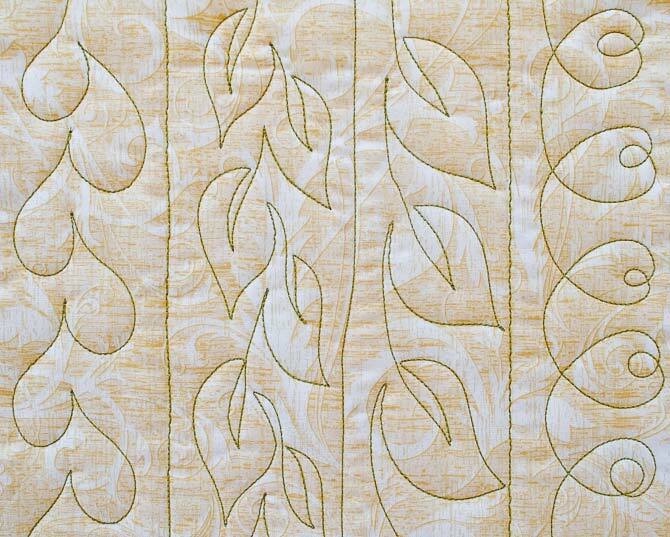 Let’s add a couple more quilting designs before finishing up our free motion quilting sample book. 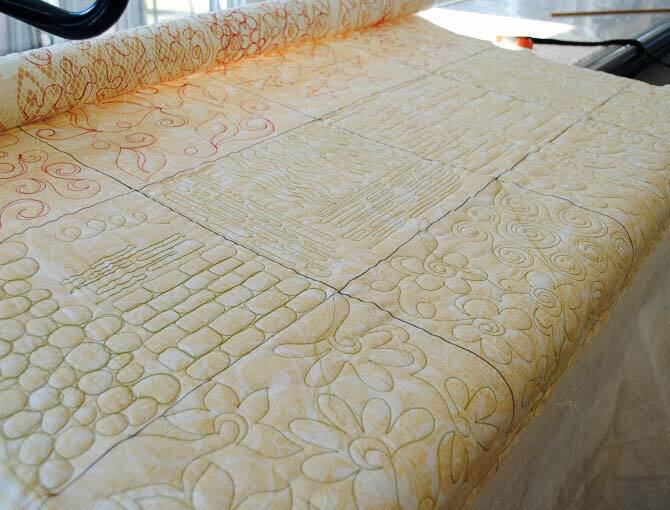 Almost every quilt has borders – wide ones, skinny ones and everything in between. Sometimes it’s a challenge to find the right design for the borders on your quilt, so today I’m going to show you some of my favorite free motion border designs and try out some new ones. The “Loop de Loop” is my “go-to” border design as it can work for most thin borders (1″ – 3″ in width). When stitching this design you alternate the direction of the loops as you go along the border. If you use a 12 wt thread such as Spagetti by WonderFil the design will really “pop”! Yesterday I showed you how to use spirals for all over designs and to make flowers, but you can also use them in borders like in the first picture. Spirals can also be made in a square shape. Same as before, you have to make sure to leave room to come back out from the middle as shown in the second picture. The third picture is a border made with square spirals. 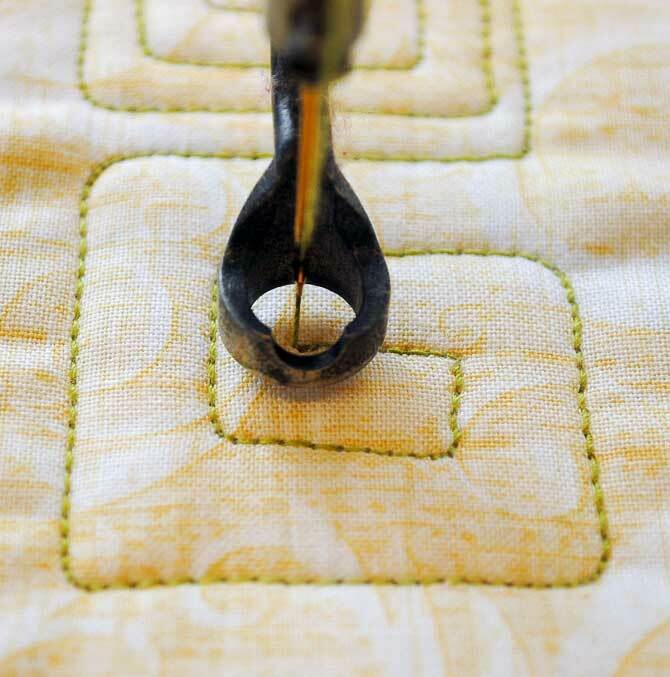 I have to admit, I often get into a quilting rut and as a result I use my “go-to” loop de loop design A LOT!! So I decided this week I should try out some new border designs. 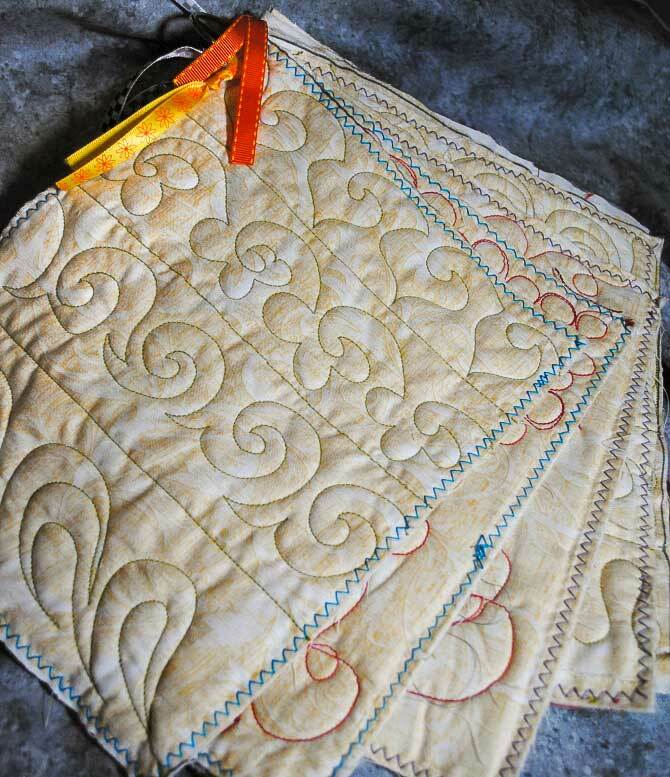 I have many books with free motion quilting designs so I hauled some of them out and tried out some of the ones that I thought I would use the most. As you can see, I probably need to practice more in order for them to be uniform in shape, but I think I could get the hang of them eventually!! Well, by the end of today I had used up all of the space on my quilt sandwich, so it was time to take it off the frame and cut all of the “pages” apart. First I trimmed the rectangles with a rotary cutter and ruler and then I finished the edges with my Spagetti and Fruitti threads and a zig zag stitch on my home machine. Using my eyelet setter, I put one hole in the corner of each page so that I could put a ring through it. Just for fun I tied some colorful ribbons to the ring. Here is my finished “book”. Now that it’s Friday, it’s time for me to say goodbye for another month. 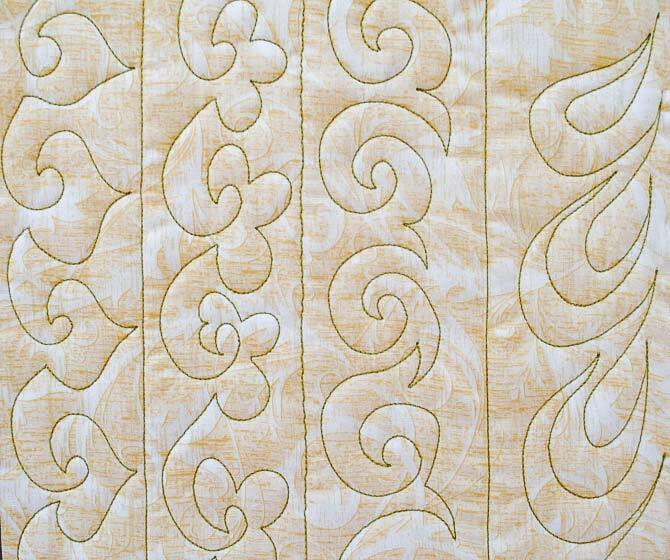 I hope you found this week to be informative and hope that you’ll be inspired to spend some time practicing your own free motion quilting! Free Motion Quilting Options and Spools? OK it is 1130pm and I just found your blog. I have the new Brother machine and yours is one of 2 sites which have become my quilting go tos.will continue tomorrow Sat and may be ALL day. SO GLAD I FOUND YOU! Could use more info on threads, but I will probably find more as I continue reading tomorrow (or later today). great information. I will be trying some of these.